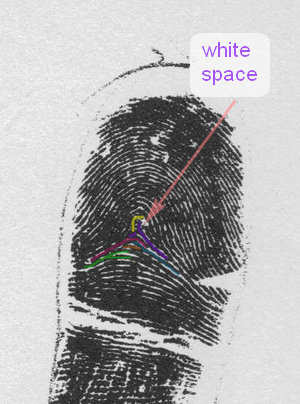 Your argument regarding the BLANK SPACES & rounded edges is only based on your perceptions about those aspects, because your argument does not include any details about what is exactly visible in the lighter version of the 1937 fingerprint. 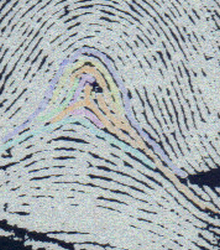 1) Ridge lines typically manifest as 'connected dots' in an ink-fingerprint. Only when there is a considerable distance between the 'dots' (which logically requires to be larger than half of the width between two ridge lines), then one could say that a ridge line terminates. 2) Another typical characteristic of a 'terminating ridge line' is that there is no likewise directed ridge line visible in the continueing path. But both of these points are not applicable to the light example of the 1937 fingerprint, because the BLANK SPACES are much narrower than ridge-width, and in this case each of the five BLANK SPACES are followed by continued ridge line which follows exactly the same path as the preceeding aspect of the ridge line. This clearly indicates that your main argument is actually... not significant at all: simply because the BLANK SPACES that you mentioned are relatively small (far too small to describe any of them as 'terminating ridge lines') - and therefore one can safely assume that the 'looping ridge line' is build by pieces that are continued elements of the same ridge line. So, I have now explained with 2 arguments why we should reject your main argument against my illustrations!!! Anyone who would take a look at this 6x ZOOMED variant of 'your picture', should notice that the quality of your picture is actually very poor: simply because in that picture is not a single ridge line visible where we can actually see where it begins... or ends. All the way this discussion, I have tried to focuss on only the characteristics that are confirmed in at least 2 of the 3 example. Patti... I agree that it 'may look like' that there is a triradius-like shape in the center of "your fingerprint" - but for sure: the two 1937 fingerprints do not show any signal of the presence of a central-triradius. 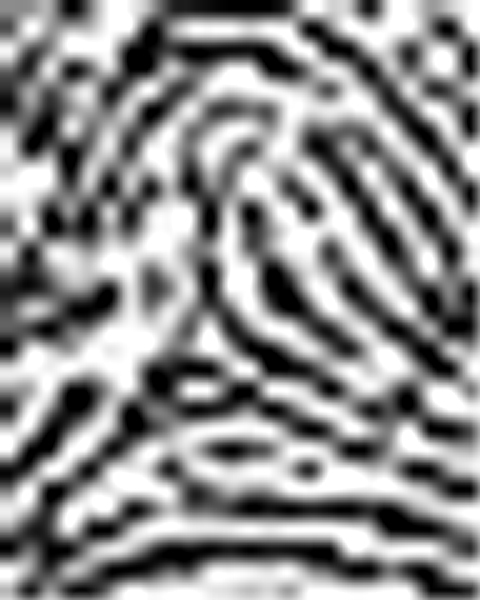 So that impression only results from that the zones between the ridges became hardly visible in "your fingerprint" - simply because there was too much ink on the finger. For sure: formally one can not find any (clear) 'upthrust' in that picture at all - because there are also 2 horizontal lines visible that clearly cross the 'your 3th uptrust' that you described.... because the earlier 'two upthrusts' where deffinitely in a different position. By the way, formally... the 2 horizontal lines actually spoil the 'upthrust'!!! So Patti, even 'your 3th upthrust' doesn't provide you a solid argument either. And regarding your claim that your 'spaggeti image' is "extremely accurate": using 'strong words' is probably not helpful to illustrate your points either. As a matter fact: I asked you to explain why you created that inverted-image: but where do you think that Photoshop will take us anyway? Usually the effects are used to create illusions - instead I can only recommend you to focuss back again on the facts that are seen in all 3 fingerprints that are available for us. It'll take a little time to work through your response. But, perhaps it's my reading glasses, but I can distinctly see the ending of the ridge lines in the negative version that I colored in. Your argument that the two apparent projections on the upthrust negates it being a tented arch. Hahahaha!! ....as if a ridge grows into a T shape!!! I view those as what I mentioned earlier in Kiwihands images. The filler ridges on the left, Cummins & Midlo called them "incipient" ridges (see page 31, fig 28) Schaumann and Alter recommend they be called "interstitial lines" and they say "The interstitial lines are omitted in ridge counting." The one on the right is an "island" according to my books. I'm guessing that you haven't bothered to try to work with the clearer negative version that I colored in, because you can see clearly there is no loop. I went to Andres Washington's web page to try to obtain the best copy of the 1937 prints. It is obvious it is an old copy of the original. Not only would you be dealing with the natural inking issues and blurring, you have the speckles and blurring by the quality of older copy machines. Not only are you working with poor quality images with low dpi, when you enlarge the image, the enlargement naturally tries to stretch and fill in the spaces with the color next to it. It would be totally impossible to get an accurate analysis of those prints. I scanned with my fairly new scanner from the original page of the book the print I am using. Do you have the book "Lion Paws"? I do not have Photoshop, I used the basic 'negative' option. It simply reverses light to dark. I'll read your response carefully later and try to respond to each part more detailed. At least your imagining a wonderful radial loop fits right in with the wonderful fantasy world of Disney! Sorry Patti, no I don't have "Lion's Pawn". 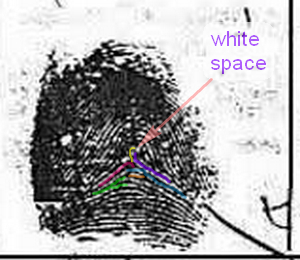 By the way, have you studied the seize of the large white spot just above the core in the fingerprint from that book? Doesn't it worry you that this large white spot is not seen in both of the 1937 examples? Why have you ignored that fact? And how do you justify to yourself that you decided to continue your focuss on that single fingerprint only? And it really doesn't make sense that you've disqualified the ZOOMED pictures of the 1937 fingerprints - because that indirectly implicates that you actually refussing to study the details in the only 2 'official' fingerprints that we have available. 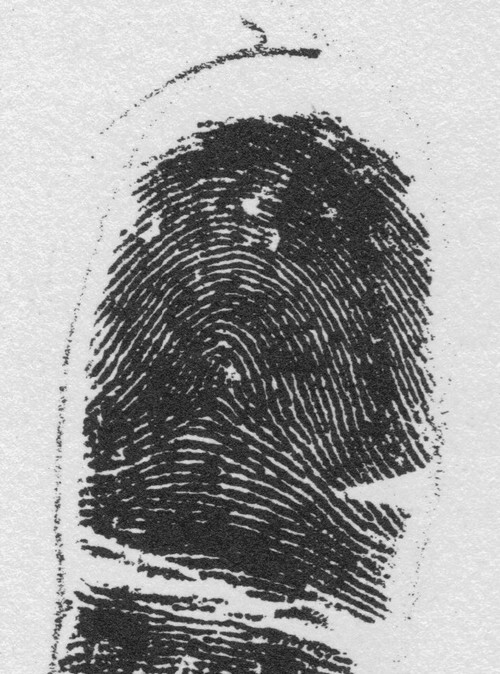 But in this handprint we can clear evidence that there was too much ink on the hand: look at the little finger: I bet we can hardly see any ridge line in the fingerprint of that little finger: what a mess! Patti, this justifies my earlier worries regarding the quality of index fingerprint: there was definitely too much ink on that hand. 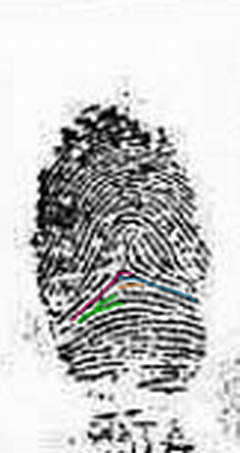 If you had asked me to exclude one of the 3 fingerprints from our analyses... you now probably know what my answer would be! BTW the print in Altman's book is a copy from Nellie Meier's "Lion Paws". It's the same print. And a poor copy of it to boot!! In "Lion Paws", the little finger is way overinked, but you can make out that it's a loop print and pretty clearly see the ridges on the other two phalanges. In Altman's book it's just a black blob. Confirmation of how quality can be lost in copying. 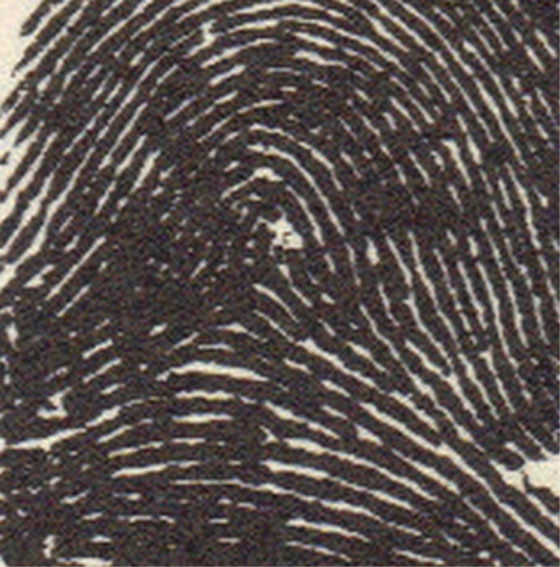 I find the 1933 index finger print we have been studying quite readable. Meanwhile, I went back to the best copy we have of the prints you are fond of working with. Honestly, I'm amazed at your bias. Ignoring the fingerprints on the paper from the State Board in 1937, but look at anything in print. There are shadowy blotches all around any text or dark markings. This was the nature of old copy machines. Look closely at the text. Many letters have blended together. 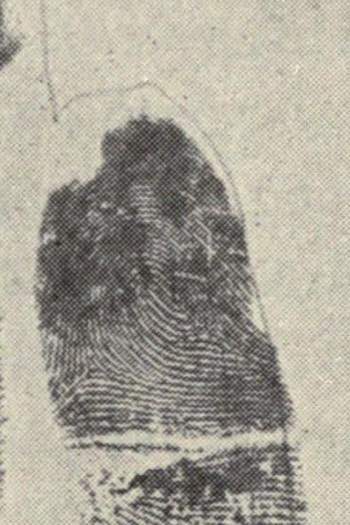 The same smearing of dark areas is common in old photocopying technology. For example look at the last letter *e* in this clip. See how it has completely closed. The same messing up of the clarity of the text is also apparent in the ink prints. The more I enlarge it the more it distorts. 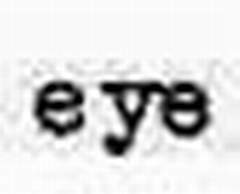 Now the *y* is touching the *e* and the top of the *y* is closed. Don't you see how enlarging the poor quality copy actually causes the features to join and merge. This is how you are obtaining a loop. Enlarging the prints from 1937 only causing the ends to blend where they should not be blending. The prints from 1937 just simply cannot be used in this hard to discern print. Perhaps the type was hit too hard and blurred - too much ink on the ribbon. But, definitely one confirmation we're not looking at a sharp clear copy. I did try to use the inkprints that you are using, but you can draw pretty much whatever you want to see in those. In my various early attempts to try to see the loop, you have interpreted as me changing my mind. I just tried different ways to follow the ridges. I discredit those prints - your attempts and mine. In the print from 1933, it's easy to follow the ridges. The white spot has a small dot in it. Could be an island ridge (looks to have 1 pore), a scar or wasn't inked. It is visible in one of the 1937 prints but just as I illustrated in the *e* sample above, enlarging it to get a good look only fills it in with shadowy color. I'll see if I can upload a sample shortly. I don't think there is anything left to discuss here. I have yet to see a loop and you don't see the tent. It is what it is. Unless we can find an even better print or Disney comes back to life we can just agree to disagree. 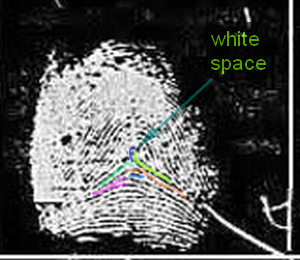 Remember as you argue for a radial loop, that Richard Unger as well as the fingerprint analyst saw Tented. So far you are the only one who has spent time analyzing the print who sees a loop. Have you noticed his little finger of the right hand actually has a form of a double loop/whorl. I don't think it's visible in the 1937 prints, but is in the 1933. It's also possibly questionable - I'm studying figures 247 and 268 (The Science of Fingerprints) to understand the differences. Patti wrote: This is so hilarious!! Patti, because in 1937 those papers were indeed written on a typewriter we can indeed safely asume that the differences in the letter 'e' are probably a direct result from how hard the machines was hit - just like you described yourself!! And let's not forget that any typewriting machine has it's own characteristics regarding certain letter combinations in words. All letters are clearly readable in that paper and the shape of the letters look perfectly normal, I see no reason at all to question the quality of the copy. So, I don't recognize at all how your observations regarding the letters have any implications for the quality of the 1937 fingerprints. PS. By the way... have you planned to answer any of my (unanswered) questions??? (See for example in my former post the question regarding the 'large white spot'). I mentioned the white spot - see above. I just finished reading through Altman's description of Disney's hands. 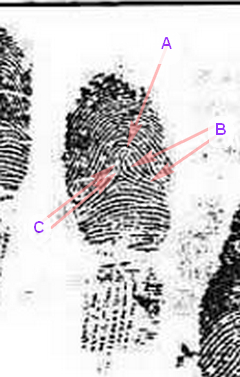 Interestingly he observed "arch-like" fingerprints. I'm also in the process of illustrating the white spot as I mentioned I would above. Perhaps you skimmed too quickly my answer. p.s. What other questions do you have that do not involve seeing a loop in the 1937 prints? You mentioned in the first post of this thread you have a high quality image. I copied that image but it is a very poor quality image, same as the one from Andres site. Do you have another better one for our use? What I'm looking at is obvious a 2nd generation. I think my observation of other printing on the page to show the distortion from copies is valid. In fact, it'd be a case of denial to ignore it. Okay (sorry I indeed missed your comment): thanks for your response! The smaller white spot in the 1937 print is not the same - please take a closer look at it's position compared to the 'core' and the upper ridge line! MORE SPECIFIC: In the lightest 1937 print there is only a small white spot - which is actually positioned a little bit higher than the 'large white spot' in the 1933. But in the darker 1937 print there is a clearly identifiable ridge line that continues all the way in that zone! While the 1933 suggests that there is no ridge line in the 'large white spot' region, both 1937 prints show that there is for sure is a ridge line. And on top of that: I already have explained why relatively small white spots can safely be ignored in ink-fingerprints! And of course: this is an important point because this actually concerns the ridge line which makes the crucial single 'looping ridge line'. You can continue denying that there is a 'looping ridge line'... but that no longer really makes sense. Especially now that there is clear evidence that other parts of the 1933 handprint show other signs that there was too much ink involved - and obviously it includes at least one flaw: the 'large white spot'!! Patti wrote: You mentioned in the first post of this thread you have a high quality image. I copied that image but it is a very poor quality image, same as the one from Andres site. Do you have another better one for our use? It's late and perhaps I didn't stay on the lines perfectly, but I think since one ridge is right above the next it should be simple to follow. The deep purple I see as flowing closely to or merging with the red one on the left side although I didn't continue the drawing. The yellow most likely is an upthrust with a radial bend. The purple is also an upthrust and is part of the triradius. Another perspective, a negative image of the above. With these you would follow the white lines and the black spaces are the furrows, empty or uninked spaces. 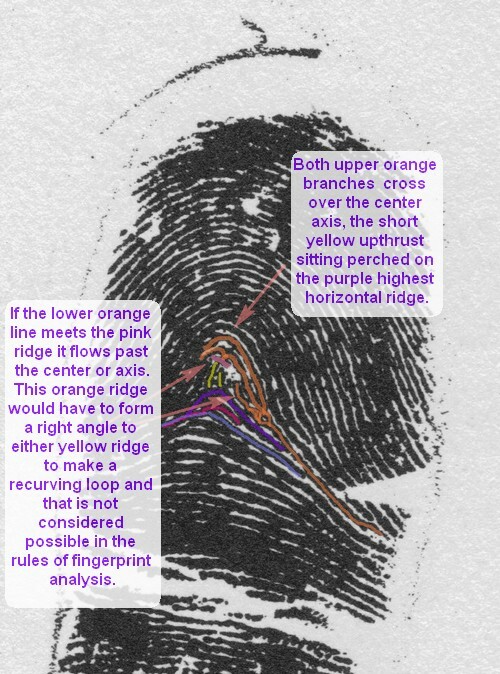 When I saw your drawings in the pictures I immediately recognized that in the pictures you have not always drawn purple line of the fingerprint at the same ridge line, and... your pink arrow is also pointing at different locations!! Therefore I have made a ZOOMED version of your drawings, and I have marked a few points (the red dot is the 'core', I have marked the core-ridge line in gold colour, and have followed + numbered four other ridge lines). Patti, now I can understand why you kept seeing things in your own way!! Because in both 1937 pictures you have putten the purple line at a ridge line that clearly does not stop at all - so in those pictures your purple line for sure does not relate to the 'core'! If you look at 'ridge line 3' in all three examples, it is quite hilarious that only in the 1933 picture you were not able to follow the path of the ridge line correctly. The 'golden' dot is the point where 'ridge line 3' has a small KINK in it's path... and there you went wrong because only in the 1933 picture you have started to follow the 'core ridge line' and made it purple. And you have made another likewise mistake regarding your yellow lines: In both 1937 pictures you have started a yellow line which starts close to the triradius and gets connected with 'ridge line 3'. But in the 1933 picture it end at the 'large white spot'. Patti, you have demonstrated that you were able to find the corresponding lines in the 1937. But regarding the 1933 picture your attempt to follow the corresponding lines... failed on multiple ridge lines. The errors in your 1933 drawings sort of 'proofs' that both 1937 pictures are of better quality!! And if you have made likewise mistakes in your observations during the past days... that would perfectly explain why you are not able to recognize that this is a RADIAL LOOP fingerprint. Patti, based on you latest drawing-efforts... I can only say that my final suggestion to you is: you better reject your idea that the 1933 example presents sufficient quality!! Because only in the 1937 examples you were able to draw the purple and yellow line at the same locations... but in the 1933 example you were not able to do that!!! I anxiously awaited to see your response. I wondered just how in the world you would dispute my drawings. And you did!!! If you are discounting it because I didn't completely finish the purple line, that is silly. I wrote that I didn't complete but said where it continued. I imagine if I even had perfect prints from Disney showing even more clearly a tented arch, you would still find a way to see a loop. I'm done here. I still (now clearly) see the tented arch. You may be content with your loop. Patti, your response sounds a bit like that you are not interested in the details that I described in your pictures, but I really needed those additionals lines to show you the inconsistancies in your drawings. By the way, I haven't discounted your efforts for the reason that you just described: I have pointed out the inconsistancies in both your purple- AND yellow lines!! Your assessment of this fingerprint is sort of build on the 'large white zone' in the 1933 print. And in your latest drawing of the 1933 print you have putten a 'pink arrow' (the pointer) right in the 'large white zone' - the 'pink arrow' is also positioned very close the end point of your purple line. You have ignored the fact that both 1937 prints clearly indicate that this 'large white zone' is actually a flaw in the 1933 print!! Simply because in both 1937 prints there is a continued ridge line visible: the darker version has definitely a firm continued ridge line; only the lighter 1937 has a couple of small white spots - but these can safely be ignored because these reflect just the nature of how ink-prints are typically created + the fact that there is less ink involved in that lighter 1937 print! Anyway, in both 1937 prints you have putten the 'pink arrow' at a very different position compared to the 1933 print!! By the way, I can image that this different position fo the 'pink arrow' is only a direct result of that you did not notice that in those pictures your purple line actually ends at a lower ridge line: in both pictures the purple line concerns the ridge line just below the purple ridge line in the 1933 print. So, you were able to produce likewise lines for both 1937 pictures... but not for the 1933 picture! And your inability to produce consistant drawings for the 1933 print perfectly illustrates that my worries about the quality of the 1933 picture are justified! Patti, I hope this will finally somehow make sense for you as well. But so far your responses indicate to me that you simply don't want to 'believe' my comments & responses... and instead you kept your focuss on the 1933 print. I have not tried to 'trick' you anyhow in this discussion - but I have noticed the continued flow of inconsistancies in your drawings, descriptions & observations. And you can not blame me for pointing out these inconsistancies... especially since you also continued to attribute significance on some other (much smaller) white zones in the prints. Unfortunately, you never answered my comments about the insignificant size of the other whites zones. But I can understand that you're done here. Click link for a 600 dpi scan of Disney's left index finger from "Lion Paws"
Patti, your words look like an attempt to keep an delusion alive... with words only! Yes, obiously your 1933 picture was worth even more than a 1000 words at this forum... untill I discovered that it has a major flaw + was made with too much ink. 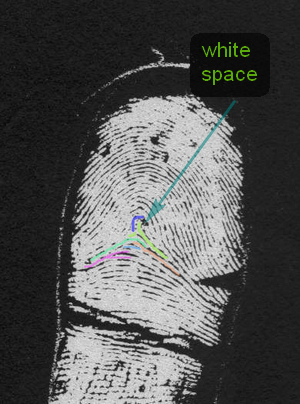 Resulting in (1) the 'large white spot' + (2) connections between various ridge lines - which are both not seen in the two 1937 examples of Walt Disney's left index finger fingerprint! The other 1937 examples indicate that this actually concerns a RADIAL LOOP; and only due to the flaws this 1933 example may appear as something else - what it not really is. I think I can fairly call this a 'delusion' because you simply refused to aknowledge the significance (and consequences) of the flaws in the 1933 picture. PS. 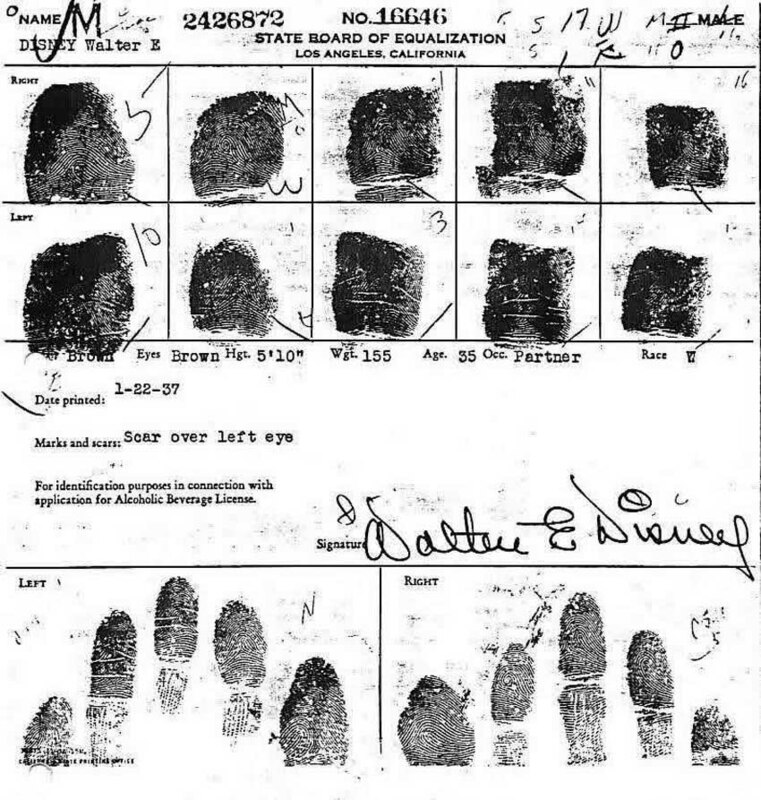 I hope that soon we will hear some feedback from other members about this Walt Disney's fingerprint. So far only Lynn shared her opion - who confirmed it as a "radial loop on the left index finger - though that was before you entered the 1933 example. We can expect that Lynn will comment again next week. Regarding purple and yellow lines, I disagree with your opinion. Three different impressions from the same finger. One several years apart. Different angles. Must take into consideration the texture - loose or firmness of the skin. Besides, in the 1937 images, anything above the red and blue ridges is distorted and that is why it appears you are choosing to make out a loop in the obscure markings. That is also why you have yet to attempt to draw your loop in the 1933 image. All you can do is try to discredit the image - when it is plain to anyone's eyes, it's the best quality of all. I honored your request to show where I saw the white spots. Please honor my repeated request to show your loop on the 1933 print. Use transparent color. Patti, your requests are probaby going nowhere.... because you appearantly hold on to your unfounded claim about 'best quality' regarding the 1933 example - even I have repeatedly described the flaws. 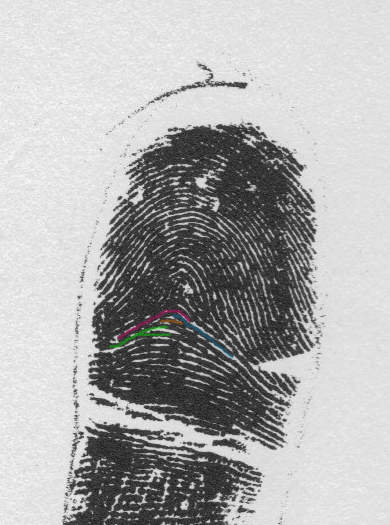 But anyway, I can actually add another element: because your position is flawed by the horizontal lines in the center of the fingerprint (I present the details below). 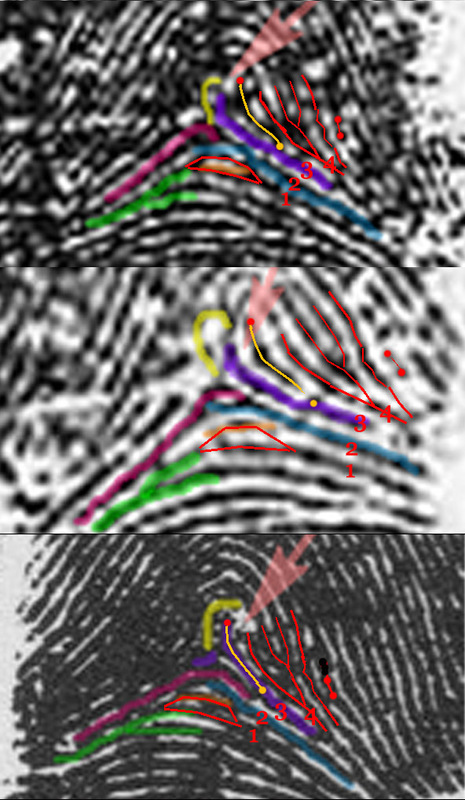 Okay, I will honour your request once more by: (1) first sharing a few more observations regarding the effects of the horizontal lines that cross the center of the fingerprint; and afterwards (2) I will explain the details of the RADIAL LOOP in the 1933 fingerprint more explicitely than what I described before. 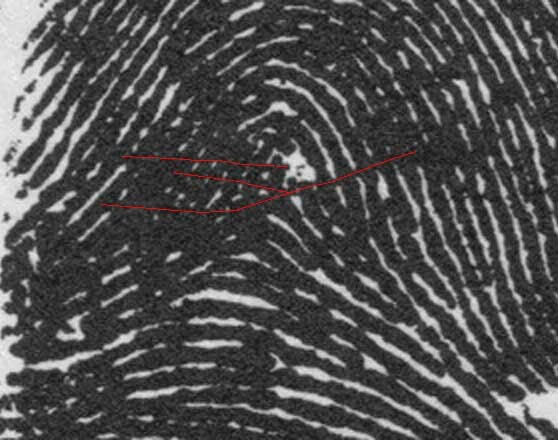 2 - This is again picture of the 'radial loop' inside the 1933 picture that I presented earlier - LET ME NOW EXPLAIN ALL RELEVANT DETAILS: The red line crosses 4 small black spots, but those black spots relate to the horizontal lines crossing the center of this fingerprint in both 1937 prints (in the darker 1937 print is also manifests as a BLACK LINE, but in the lighter 1937 print is manifests as a WHITE LINE) so that is why we can safely ignore them; and the green line connected with both orange lines is where I have noticed the flaw in this print. PS. The illusion of 'your upthrust' results also from the most prominent horizontal crossing line! Patti, if you have red the details that I just described properly, I could imagine that you are now getting confused by all the elements that I have considered in my assessments all the way!! Again, I am not trying to 'trick' you anyhow. 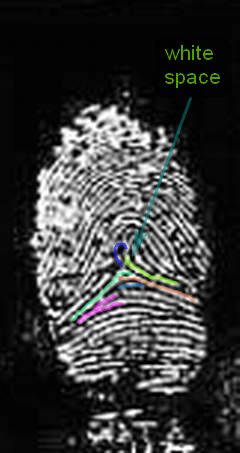 It is quite simple: because as long as you do not accept that there is a major flaw in this picture (related to the 'large white spot') ... you will never notice that this fingerprint is a radial loop! The white spot isn't that important. The only print that is significantly different is the worst sample from the 1937 prints. That print has the most distortions and fingerprint impossibilities. There is a very strong similarity between your top sample of the 1937 print that was marked with a T (on the best sample from Andres' site) and the 1933 sample. Only the middle sample does not match. How about I agree to work with you and that one 1937 print along with the 1933 print. I noticed last night that both could be pretty well be matched up. Now if we can agree on the top 3 samples from my earlier post where the ridges are only matched under the lower type lines? Are we in agreement as to the ridges you have marked 1, 2, and 3 in your three examples? In the lower sample, 3 is the same as the one I colored purple and you overmarked in pink. I'm still trying to see the loop you are pointing out and giving you every fair chance to convince me it's there. So let's at least see if we can find the boundries of this print where we agree and where we diverge. I'm sure we can do this professionally without having to reduce to ridicule and rolling around on the floor. My reasons to discredit this print. A: I have never seen a crescent moon shape ridge sitting atop a pole in my entire 30 years of closely observing dermatoglyphics. 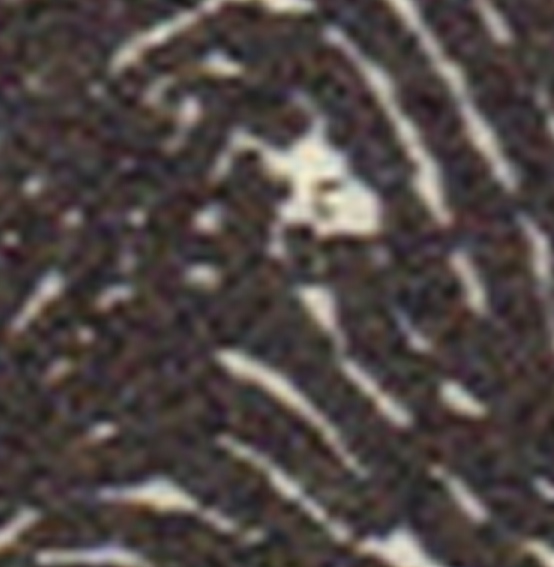 B: The ridges in this print appear to end prior to touching the pole with a crescent moon shape on top. To imagine they continue to this configuration would mean to take into consideration the lighter grey shading which is very obviously inherent to the copy process. This shadowy nature is consistent throughout the source of this image and cannot be disregarded. Even if one sees these as touching the pole w/ crescent, they are doing so at right angles. C: This space is very obscure and cannot without creative help and imagination be completed to form any pattern that could be agreed on. * Stretching this image to increase it's size on the page distorts the image from it's clearest form, which is lousy at best. The 'large white spot' is important... and I can now proof it! I already describe why that spot is a crucial element regarding the 1933 print. And actually... I am now able to proof that the 'large white spot' is definitely a flaw in that picture!! !The new picture (see below) shows again where the RADIAL LOOP is found in all three examples... but now I have illustrates each of the examples with a red circle which illustrates exactly the zone where we found the 'large white zone' in the 1933 print. As you can see in both of the 1937 prints that zone is filled with a ridge line: in the DARK 1937 example that ridge line is completely printed with ink on the paper, while in the LIGHT 1937 example the same ridge is alsmost completely printed. And we can now see how in the 1933 the 'large white zone' is exactly created (see the 3th example below): the ridge APPEARS to be missing almost completely... but now that I have made this picture I actually recognize that we can actually see 2 small traces of the ridge line!!! Only in the 1933 prints (see the 3th example) that zone is almost empty, but still: the 'two traces of the ridge line' are clearly visible!! Patti, regarding your propositions... after describing my new 'discovery' you should be able to understand that I see no need at all to exclude any of the prints from our discussion. Don't get too excited for yourself. If you follow and count the ridges upward from the obviously matched ridges (see above illustrations) you will see that you actually haven't matched the 33 print to the 37s. Why don't we work from those ridges we agree on as I mentioned in my previous post. Perhaps you have and don't like the result....? Patti wrote: Don't get too excited for yourself. If you follow and count the ridges upward from the obviously matched ridges (see above illustrations) you will see that you actually haven't matched the 33 print to the 37s. Patti, where did you so far express your agreement about any of the details that I described? I think so far you never gave your agreement about anything! So, how realistic is your 'proposal' regarding working to find ridges 'we agree on' really? Your latest response appears to me as if you are unwilling to consider the zone of the 'large white spot'. If so, then our discussion will probably end here because I am very aware that the 'large white spot' in the 1933 is the main cause why this discussion has continued... on and on and on!!! 1 - Your proposal regarding rejecting the LIGHT 1937 print is actually quite unrealistic... because I clearly described from the beginning why from my point of view that is actually the print that presents the best quality: simply because the quality of the other two prints is at least partly 'spoiled' because there was too much ink on the finger. 2 - By the way, after composing my last picture... 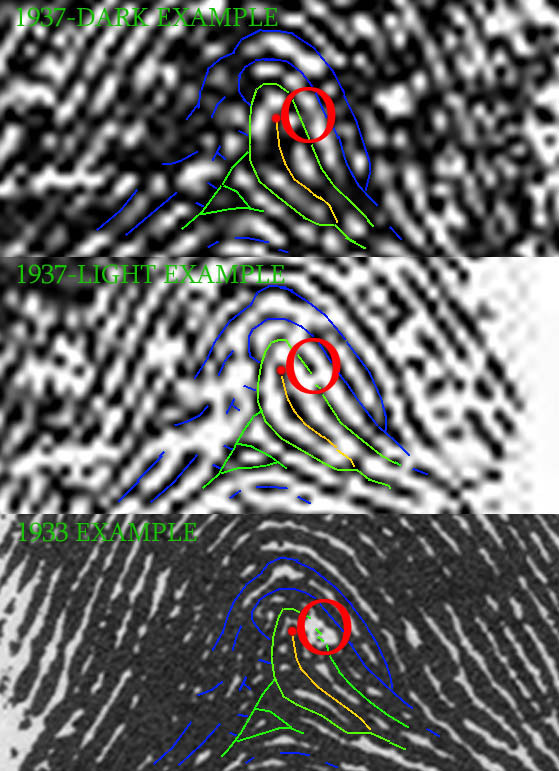 I do understand from ONE PERSPECTIVE ONLY why you describe the 1933 as 'the best': because I now have noticed that the 1933 picture does have the highest resolution... but that does not implicate at all that is also 'the best fingerprint'. So, I see no options to change any of my conclusions so far. Because the RADIAL LOOP is clearly visible in my last pictures + illustrated by the lines that I have drawn... I don't understand what you actually have in mind regarding finding agreement about any individual ridge lines. But maybe you are willing to explain your thoughts regarding how to find common agreement... regarding the zones INSIDE the red circles of all three prints?? ?